Did you know Target will donate up to 1% of your RED card purchases at Target stores in the U.S and at Target.com when you link your Target Red Card to Sierra Verde? It's easy to sign up. You can enroll online at Target.com or have them link your Red Card to Sierra Verde next time you shop at Target. 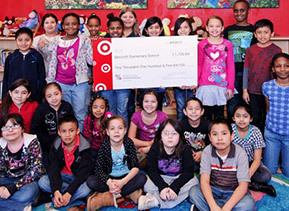 Target's Take Charge of Education Program has raised approximately $354 million dollars for schools since 1997. Wow!! !